The top lithium companies are planning to at least double production before the end of the decade. Companies around the globe are investing billions of dollars in lithium-ion battery manufacturing facilities. Last year, the top 13 battery makers boasted annual production capacity of 29 gigawatt-hours (GWh) of energy-storage products. By 2020, those same companies are expected to grow production capacity to 171 GWh, with Tesla's first Gigafactory representing 35 GWh all by itself. Rising demand and prices for the top two lithium products -- lithium carbonate and lithium hydroxide -- have driven revenue, income, and shares higher for the world's top lithium producers. From established companies such as Albemarle and SQM to relative newcomers such as Orocobre, simply reporting results from a lithium segment has been all that's needed to gain Wall Street's admiration. Of course, the actual results have helped, too. Albemarle reported 31% year-over-year revenue growth in its lithium and advanced-materials segment in the first quarter of 2017, while adjusted EBITDA jumped 38% in the same time period. Meanwhile, FMC Corp.'s lithium segment posted revenue and operating income growth of 9% and 45%, respectively, in the comparison periods. The company generates most of its business from agricultural products, but lithium promises to power an outsize amount of growth potential. And for good reason. A not-so-quick journey through SEC filings and other regulatory documents shows that the ongoing party for lithium stocks and their shareholders may not end anytime soon. For instance, Albemarle recently announced the regulatory approval to expand lithium concentrate production at its Greenbushes, Australia, mine within a 50/50 joint venture. The expansion won't begin until the second quarter of 2019 but will more than double lithium carbonate production capacity. The specialty-chemical company isn't waiting until then to grow capacity. Capital expenditures in 2017 are expected to range from $350 million to $400 million. If the amount dedicated to ongoing operations hits the top end of its historical range of 4% to 6%, then investors can deduce that Albemarle is investing between $190 million to $240 million in growth and expansion projects -- with much of that dedicated to its lithium segment. Not to be outdone, FMC Corp. is investing heavily to expand its lithium operations. In May 2016, it announced plans to triple lithium hydroxide production capacity by 2019. The first phase of the expansion project will begin contributing to operations in mid-2017, while subsequent additions from the modular build-out will make their presence felt over time. Management also admitted that the long-term plan is to spin-off the lithium segment as a separate publicly owned company -- possibly making it the first reputable pure-play lithium stock available. Promises to double and triple (or more) lithium production can be found throughout the industry, but that also applies to the entire country of Argentina -- home to Orocobre's quickly expanding operations. The South American country is the world's third largest lithium producer and has bountiful reserves smack-dab in the middle of the infamous Lithium Triangle with Bolivia and Chile. Companies new and old, foreign and domestic, are racing to buy and develop land in the Olaroz and Cauchari formations. Orocobre is doubling production and processing capacity in the former by 2018 within a joint venture with Toyota Tsusho Corporation, a member of the Toyota Group that largely exists to support the operations of Toyota Motors (hint, hint). Once complete, processing facilities in Olaroz will be able to accommodate the first commercially operable projects in the enormous Cauchari deposit, which is just 20 kilometers away. That includes large projects by Lithium Americas and China's Ganfeng Lithium, Albemarle, and Orocobre's direct development with Canada's Advantage Lithium. The ramp-up of lithium-ion battery manufacturing facilities in the coming years will need to be matched by the ramp-up of lithium supply from various producers. The good news is that the industry's largest companies are up to the task. 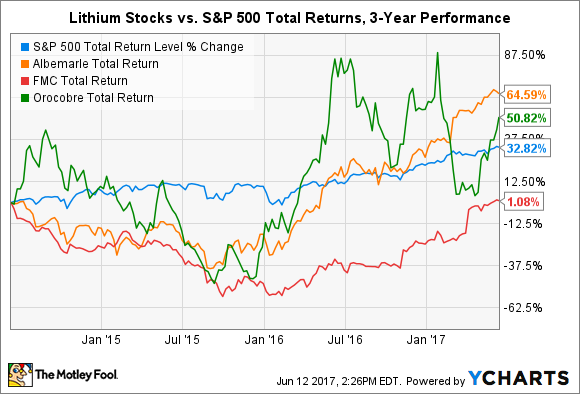 If you're looking for the top lithium stocks for your watchlist or portfolio, then give Albemarle, FMC Corp., and Orocobre a closer look.